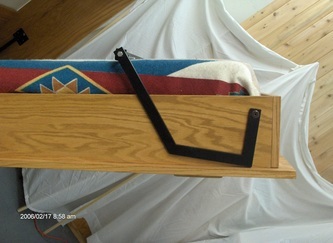 We also install a four inch wood handle to the upper right and left corners of the bed face, this is an inconspicuous place yet very functional. We etch the front face so it appears to be four separate doors. 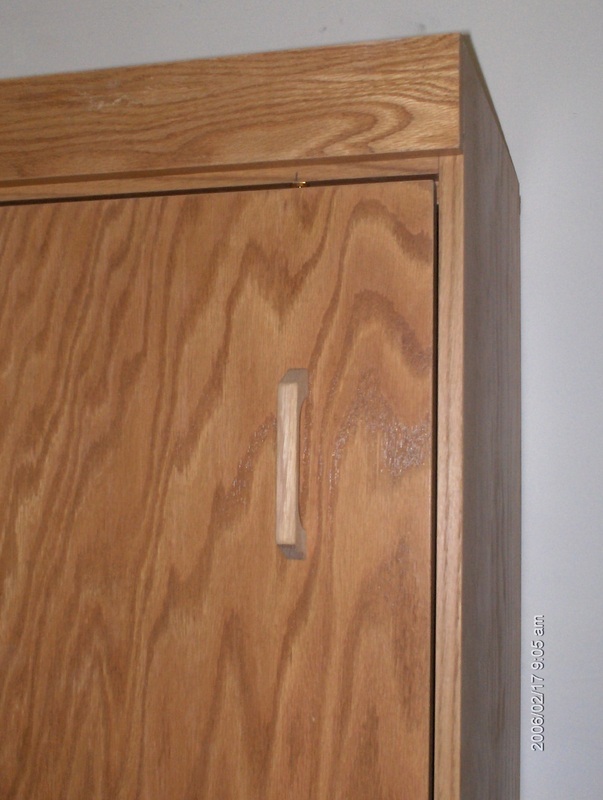 We also add a 3/4 inch x 3 1/4 inch x 45 inch trim board on the bottom and top of the front of the cabinet, this really makes the cabinet look great. I have been building and installing Murphy Beds for over 10 years and as far as I am concerned this is the best system and style on the market today. 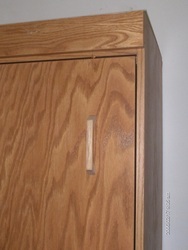 We make it out of 3/4 inch Birch or Oak, both look great. All edges get wood edge banding and every part is sanded with 220 grit sandpaper. 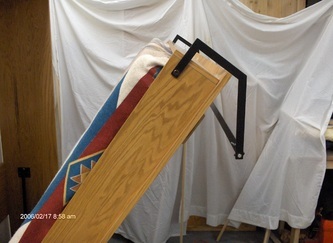 The counter balance for the bed is two nitrogen gas pistons. These pistons are not subject to metal fatigue or catastrophic failure. 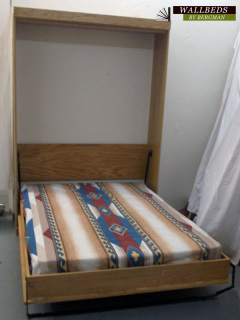 I am offering the side beds with soft close gas springs. The pistons are held in place by metal plates and pins, this will allow you to change a piston fairly easy if that should become necessary. I have been told by engineers that these pistons should last 20 years with daily use. All the metal parts are powder coated steel black.. Metal plates are thru bolted to the bed frame and the side panels with furniture grade antique brass finish bolts(flat head). The hinge is a 5/8 inch metal rod on a metal plate that is bolted and screwed to the bed frame and side panel.I have added to these units a 5/8 inch collar that goes between the bed frame and the side panel, this becomes a one time adjustment so the pressure from the piston against the side panel can't draw the side panel into the bed frame. 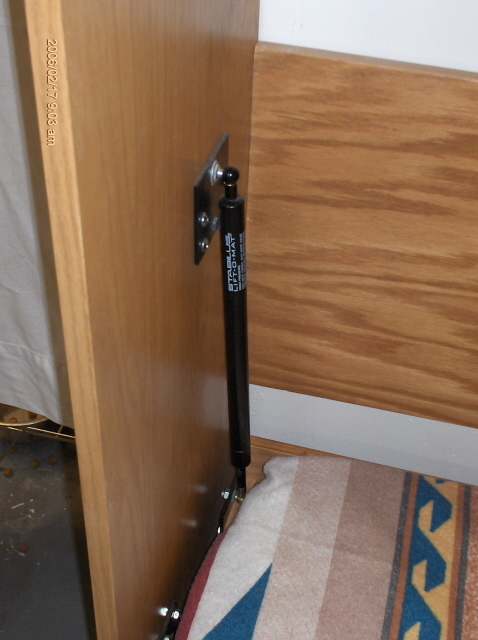 This allows you to maintain a 3/16 inch exposure between the bed doors and the side panel. This overall system has been on the market for at least 15 years in many different forms. My system is an overall improvement of these other systems. Payments can be made with 1/2 down balance at date of shipping with a check or Pay Pal. Credit cards are welcome too.